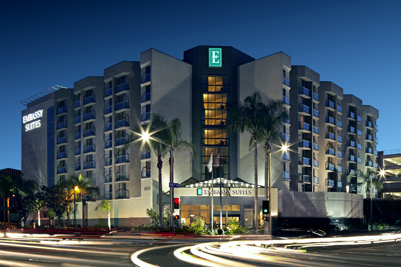 The Embassy Suites by Hilton Los Angeles International Airport North features newly renovated suites just half a mile from LAX Airport and the Los Angeles coastline. Enjoy our complimentary cooked-to-order breakfast and complimentary Evening Reception, while experiencing California cool in the warm, friendly ambiance of our all-suite hotel near LAX airport. Here you'll find the perfect balance of comfort and functionality - with spacious two-room airport hotel suites, elegant décor, and complimentary basic Wi-Fi. Don't feel like fighting L.A. traffic to find a room? Leave the driving to us. Our free 24-hour airport-shuttle service runs continuously every 30-45 minutes*, and our convenient parking packages make us the perfect choice among LAX park and fly hotels. A short drive from downtown Los Angeles, the Embassy Suites LAX North will make you feel right at home while placing you minutes from the city’s famous shopping and iconic attractions. We are also a great option for extended or long-term stays! Recipient of the Tripadvisor 2018 Certificate of Excellence and Hall of Fame! * When you exit the LAX terminals, look for the red station marked "Hotel Shuttles." Our shuttles are yellow, marked with the hotel logo in the window, and are shared with Airport Center Express and the Residence Inn Los Angeles at LAX. All major credit/debit cards are accepted and are required upon check-in. Credit cards must have a chip. A hold may be placed on your card account for the full anticipated amount to be owed to the hotel, including $50 per day for estimated incidentals, through your date of check-out and such hold may not be released for 72 hours or longer from the date of check-out at the discretion of your card issuer. Prepaid credit cards, temporary credit cards without a cardholder name, and cash will not be accepted as a deposit. A $75 early departure fee will be applied to folio if guest checks out prior to previously booked check-out date. In compliance with fire code, no more than 6 people may occupy a suite at any given time. In addition, overnight parties are not allowed, and guests may be required to sign an agreement upon check-in.